Pictured (L-R): Tom Hanrahan, Greg Frey, and Judy Lakin. 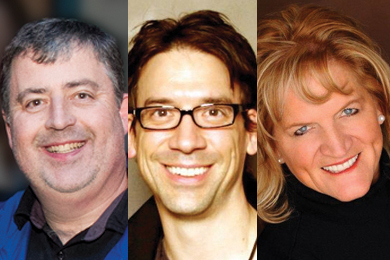 New leadership was announced Monday, April 6, for the 2015-2016 Country Radio Seminar Agenda Committee. Leading the committee are Tom Hanrahan (Sr. VP of Programming / iHeart Media of Alabama) as Chairman, as well as Greg Frey (Corporate Program Director Program Director – WKHX, KICKS 101.5 Atlanta / Cumulus Media, Inc.) and Judy Lakin (Director of Sales, Cox Media Group Houston KKBQ-FM / KTHT-FM / KGLK) as Co-Vice Chairman.